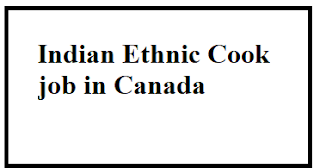 Indian Ethnic Cook Required in Canada: If You Find job of Indian Ethnic Cook. Then You came at right place Because Here We provide best available job of Indian Ethnic Cook Required in Canada. Please read whole article proper and check requirement, eligibility, skill. If you have match all these criteria then apply for this job as mention below. The Nirvana Restaurant Ltd. at 2313 Main Street in Vancouver BC hires F / T and permanent Indian ethnic chefs to prepare Indian ethnic dishes. Must be able to cook all kinds of ethnic dishes like Karahi Chicken / Paneer, Navrattan Korma, Veg Kebab, Chicken Kebab, Butter Chicken, Daal Makhni, Gravy etc. Must be able to work with minimal monitoring. The task is to prepare food and meals to order, to supervise and guide kitchen helpers, to care for the stock and to keep the cooking area clean. Experience of 1 year or more as an Indian ethnic cook is needed. A salary of US $ 18 per hour is paid. The work lasts at least 40 hours / week. Overtime and other benefits are given. Must be available on weekends and evenings. Please send your CV to ddhani2313@hotmail.com.